A potatoe is like a potato, except that it isn't. It's also like a tomatoe, which is like a tomato, except that it isn't either. But the way in which it isn't like a tomatoe is different from the way in which it isn't like a potato, which is completely unconnected to the way in which a tomatoe isn't like a tomato. Or perhaps it is? "Potatoe" is "potato" with an "e" on the end. 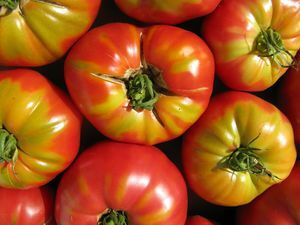 "Tomatoe" is "tomato" modified in the same fashion. Therefore, a potatoe and a tomatoe are similar because they are spelled similarly. However, a potato and a tomato are rather different from each other, so modifying each one in the same way will not reconcile those differences; so a potatoe and a tomatoe must be different in the same way that a potato and a tomato are different. The only difference between the differences of the different pairs is the difference from one pair to the other, which is a similarity by the very nature of being different, but fails to fully reconcile the original differences as has been said earlier. It is difficult so far to conclude anything about all this, so we will endeavor to summarize the differences between a potato and a tomato that are most likely carried over into their derivatives, the potatoe and tomatoe, unless they aren't. A potato is a root vegetable, whereas a tomato is a fruit. It may also be a vegetable. Perhaps it is both - but what is certain is that it does not grow in the ground, whereas a potato does. 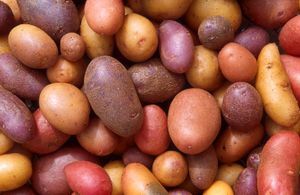 It is also red and squishy, whereas a potato is brownish and hard. Both of them can be green, but a tomato is green when it is young, whereas a potato turns green when it is exposed to light. Those are all differences. They are similar, however, in that they both originate from plants, and that both can be sucked dry by Bunnicula. It seems most likely that these characteristics would be carried over into the potatoe and the tomatoe. The addition of an "e" should not change any of them. However, there is no way to know that for certain. It could change the colour, the plantness, or the nature of the vegetable (or fruit) altogether. Many words that differ by a single letter have an entirely different meaning, as well as many words that differ not at all or only in speech, so certainly we cannot trust that "e" not to do something to the meaning that nobody gave it permission to do. It may look innocent and small, but in fact it could be very dangerous. Not to worry, though: we have a clue as to the motives of the e, namely the plural form of "potato" and "tomato". Potatoes or potatos? You decide. The title of this section tells the story. "Potato" and "tomato" are often pluralized by adding -es, rather than simply -s. This results in their looking exactly like what one would suppose to be the plural of "potatoe" and "tomatoe". 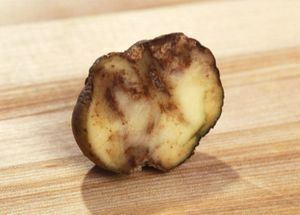 This may mean that when a potato is pluralized it becomes a potatoe; however, all known examples of potatoes look like a plural version of a potato, which means either that a potatoe is identical in appearance to a potato, when several instances of "potatoe" are combined each one of them becomes a "potato", or the photographs were faked. It is also worth noting that potato and tomato may also be pluralized as potatos and tomatos, but this spelling is less widely used and our spellchecker is adamant that these spellings are incorrect. There is a final piece of the puzzle. Dan Quayle claims that potatoe is actually the correct spelling of potato, or at least implied as much when he advised a young child of this. Since it is demonstrably the case that potato is the more correct spelling, and Quayle had every reason to know this, it is obvious that his motivation is malicious rather than ignorant. Now that we have assembled all the available evidence, the conclusion seems clear. The potatoes have been hijacked by Quayle and his evil minion e. They are not terrorists because they work for the government, but they are trying to make it look as if al-Qaeda is actually responsible, and if the other government officials get hold of this essay they will most likely deny their involvement with Quayle and e. But we must never forget that potatoes are an inside job, and we probably shouldn't eat any because they are most likely being used to convince us that there aren't any mind control towers. This is most likely done with anthrax or something. Probably. This page was last edited on 31 October 2015, at 17:25.